A graver trouble soon arose. In 448 Flavian had to condemn the rising heresy of the monk Eutyches, who obstinately denied that Our Lord was in two perfect natures after His Incarnation. Eutyches drew to his cause all the bad elements which so early gathered about the Byzantine court. His intrigues were long baffled by the vigilance of Flavian; but at last Eutyches obtained from the emperor the assembly of a council at Ephesus. It convened in August 449, presided over by his friend Dioscorus, Patriarch of Alexandria. Into this “robber council,” as it is called, Eutyches entered, surrounded by soldiers. The Roman legates could not even read the Pope’s letters; and at the first sign of resistance to the condemnation of Flavian, fresh troops entered with drawn swords, and, in spite of the protests of the legates, terrified most of the bishops into acquiescence. The fury of Dioscorus reached its height when Flavian appealed to the Holy See. 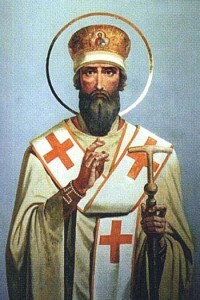 Then it was that he so forgot his apostolic office that the Pariarch of Alexandria laid violent hands on his adversary. St. Flavian was set upon by Dioscorus and others, thrown down, beaten, kicked, and finally carried into banishment. Let us contrast their ends. Flavian clung to the teaching of the Roman Pontiff, and sealed his faith with his blood. Dioscorus excommunicated the Vicar of Christ, and died obstinate and impenitent in the heresy of Eutyches.